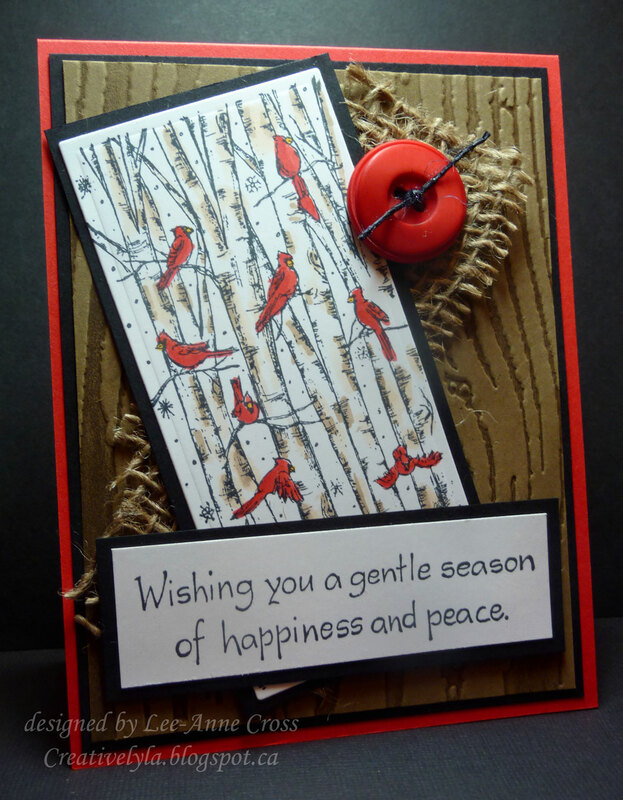 A card for Lydia’s Hope You Can Cling To Challenge…a walk in the woods. It’s all about what you may see on a walk in the woods. I absolutely love cardinals but sadly they don’t visit our locale. So my walk today is through a forest full of birch trees and cardinals. My background is a Tim Holtz embossing folder that’s been inked with SU! Soft Suede before it was run through my Big Shot Pro. Next comes a strip of burlap. The image has been colored with Copics and matted on black card stock. Sentiment has also been matted on black card stock and is popped up on dimensionals. And a button with twine is the final touch. Back soon with one final card for the Hope You Can Cling To Challenges. Hard to believe today is the final day of challenges. Soon the MD Anderson Center in Houston will be receiving our cards and good wishes. So happy to have been part of this worthwhile cause again this year! Next Next post: It’s the Most Wonderful Snowman er…Snow Woman?